Port Elizabeth - The key to success is adapting to conditions as quickly as possible, Proteas captain Graeme Smith said on Thursday, ahead of the first cricket Test match to be played in Port Elizabeth in five years. "Mentally, we need to be able to shift our mindset from the other grounds in South Africa and play accordingly. Just being able to quickly identify what we’re up against is going to be the key," Smith said on the eve of the second Test against New Zealand. "I think the conditions here will suit the Kiwis’ style a little bit more, so it’s going to be about adapting and starting well. The wind plays a big factor at this ground and it’s a different style of cricket that you need to play here to be successful." The last five-day game at St George’s Park was the Boxing Day Test in 2007, when the hosts went down by 128 runs to the West Indies. The Proteas also lost their two previous Tests at the ground, against England in 2004 and Pakistan in 2007. "Hopefully we can go out and put all our hard work into play and put all those hoodoos and negativities (sic) to bed," Smith said. "We would love to go on and win the series, and keep winning - that's what it’s all about." The Proteas have one forced change to the side which beat New Zealand by an innings and 27 runs in Cape Town last week, with Rory Kleinveldt replacing the injured Vernon Philander. "Rory gained a lot of experience in Australia and the way he fought back in Adelaide after a tough Test in Brisbane has given him a lot of strength," said the skipper. "He’s had good preparation going into this game, unlike Adelaide where it was thrust upon him on the morning of the game. He’s bowled well at domestic level for a long period of time and he’s probably played more cricket in Port Elizabeth than most of us in the team." Kleinveldt had a good understanding of what was required of him and it was a fortuitous opportunity for him to grow as a cricketer at Test level, said Smith. 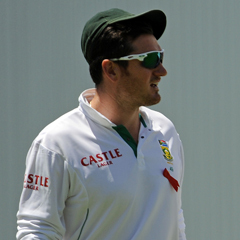 Developing Kleinveldt into a fully-fledged Test bowler also added more depth to the squad. Morne Morkel would be given an opportunity to take the new ball. Smith said his physical strength would be an advantage in the local conditions. "Morne’s taken the new ball a few times for us before Vernon came into the team, and he does bowl well in windy conditions as he’s strong at the crease. "He’s an asset for us because he’s a guy who can bowl heavy balls into the wind, which is important for us." Smith said he was thoroughly enjoying his captaincy and working in an environment where the coach and management staff had removed a lot of pressure from his shoulders. He could concentrate more on the actual game of cricket rather than on what was happening off the field. The same cannot be said for New Zealand captain Brendon McCullum, who received a rude awakening in his first Test as captain last week when his side were bowled out for 45 in the first innings. "We can’t overlook what happened in that first innings, but at the same time we can’t dwell on it because it affects your ability to move forward and it affects your confidence," McCullum said. "While we learned the lessons from it, we also identified that we made progress and made some really good adjustments in a very short space of time. We showed some qualities that we want to be known for as a team." McCullum said his team had shown character and fight in the way they bounced back and managed to exert pressure on South Africa at times. James Franklin has been ruled out with a hamstring injury and Colin Munro would be given the opportunity to make his debut, batting at No 7 and as a fourth seam bowler. Pretoria-born Neil Wagner, with two Tests under his belt against the West Indies, would be given another opportunity, replacing another left-arm seamer, Chris Martin. "While Martin got three wickets later on in the last Test match and bowled reasonably well, we thought the more aggressive option of Wagner - especially with a potentially drier pitch and his ability to reverse swing the ball - is going to serve us better to try and even up the series," McCullum said. "Neil’s an aggressive customer and I expect him to play extremely hard, especially being from South Africa and playing against South Africa. He’s very excited to be playing against some of his old schoolmates," he said. Umpires: Ian Gould (ENG), Kumar Dharmasena (SRI). TV umpire: Rod Tucker (AUS). Match referee: David Boon (AUS).